Try I: 1.Rd6? Rc7 2.Be2 Rc3! 3.Re3 Rxe3! (3…Nd2+?) 4.Ba6 Re7! Try II : 1.Rd1? Rc7! 2.Rxb1 a2! 3.Rd1 b2! 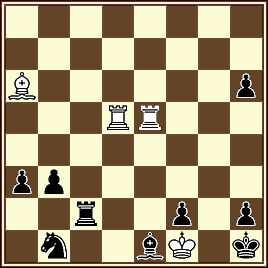 4.Bd3 b1Q 5.Rxb1 axb1Q 6.Bxb1 Rc4! 7.Ba2 Rd4! 1…Rc7 2.Be2 Rc3 3.Re3 Rxe3 4.Ba6 Nd2+!